German rabbi; born at Markt Uhlfeld, Bavaria, Jan. 4, 1780; died at Bamberg May 12, 1862. At the age of thirteen he entered the yeshibah at Fürth, and for six years he studied rabbinics there. In 1808 he was elected rabbi of Uhlfeld. He accepted no salary or emoluments. For many years he held also the post of president of the congregation. He introduced reforms in house and synagogue, and established a school in which he shared the labor of the teachers. In 1819 a beautiful synagogue was dedicated concerning which he published a pamphlet, "Die Israelitische Tempelhalle, oder die Neue Synagoge in Uhlfeld, Ihre Entstehung, Einrichtung und Einweihung, Nebst den Drei Dabei Gehaltenen Reden." He preached in German at a time when other Bavarian rabbis could neither read nor write the vernacular. In consequence of the law of June 10, 1813, which made the "Schutzjuden" citizens of Bavaria, and which demanded that the rabbi should have a university training, Rosenfeld submitted to a new examination. In 1826 he was elected rabbi of Bamberg, which post he held until his death. He took an active part in the work for the emancipation of the Bavarian Jews, and wrote a number of pamphlets on this subject (see Jew. Encyc. ii. 604b). Rosenfeld edited "Stunden der Andacht für Israeliten" (4 vols., Dinkelsbühl, 1834; 2d ed., 3 vols., ib. 1838). Selections therefrom in Hebrew by M. Bendelsohn of Grodno appeared at Wilna in 1854 under the title "Hegyon ha-'Ittim." 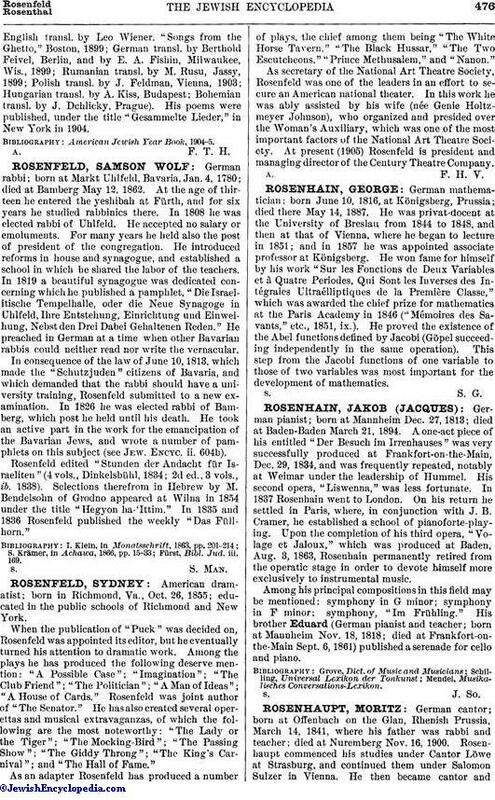 In 1835 and 1836 Rosenfeld published the weekly "Das Füllhorn." Fürst, Bibl. Jud. iii. 169.